Compare prices from several car hire companies in Burgos and find the best price for car rental. Our prices always include unlimited mileage and insurance. Burgos is situated on a plateau of approx. 850 meters above sea level in Spain’s northern hinterland. 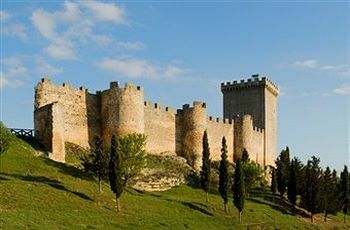 The city belongs to Castile-Leon region, and was founded in the year 884. In 2010 the population was measured at almost 180 000, and Burgos is the capital of the province of Burgos. Winters in Burgos is one of the coldest in the country. Tourism is an important part of business, and many visiting the city because of its beautiful architecture. The most famous sights are the cathedrals, churches and monasteries. Among other things, one should visit the Burgos Cathedral of white stone that was begun in the 1200s and listed on the UNESCO list of world heritage. Burgos Airport is located approx. 4 km outside the city center and has been named Villafría. The destinations are Palma de Majorca, Barcelona and Paris.